« Is Brian Matusz a Realistic Starting Rotation Option? Today, John Lynch tackles the tough questions about the Tampa Bay Rays. Orioles Proving Ground: From the front office to the lowly clubhouse attendant, the Rays just seem like a likable/cool team. What do you think makes them so likable? John Lynch: I think it’s the counter-culture desire to like to see someone beat the Yankees or Red Sox with any consistency. All respect to the Blue Jays (WS Champs in the early 90s), and the Orioles (Mr. Ripken’s team) but there’s a draw for anyone wanting to see those 2 behemoths beaten. The Rays have had a young and talented team that’s won recently and that makes them cool. Joe Maddon‘s sweet glasses are an added bonus. OPG: There was a lot of speculation that the team would trade David Price (a free agent after 2015) this offseason. There is virtually no chance that the team will be able to afford him much longer. How long do you think the team holds on to him and where do you think he ultimately ends up? JL: Traded to a contender this summer, a dark horse like the Nationals and then he signs an uber deal with the Cubs this winter. 7 years for 180 million. OPG: The Rays have had terrible attendance (last in the AL over the past 2 years) despite 6 winning seasons and 4 playoff appearances in the last 6 years. Many believe it’s the result of the terrible stadium they play in. With the city of St. Petersburg seemingly not willing to bend on a lease that’s in place until 2027, any brilliant ideas as to how we could get this issue resolved? JL: The Red Sox build seats on top of Fenway. The Rays should start selling tickets for the catwalks above the field. They could also learn a thing or 2 from the Cubs outfield section and treat part of the stadium like a beer garden. Cheap seats and make up their costs in concessions. OPG: Rays fans show support for their team during games by making noise with cowbells. Annoying or most annoying thing ever? Can you think of anything that’s similarly done at a sporting event that’s worse? JL: Some kid from my high school’s mom came to every game, home and away, and banged the hell out of a cowbell every time she thought her son did something worth cheering for. This was high school. We were terrible. He was a lineman. 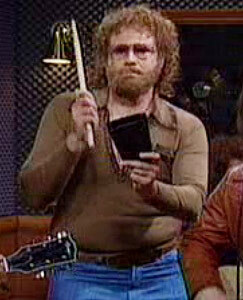 If I never hear another cowbell in my lifetime, I’ll still have scars from those days of my youth. Wait, what was the question? OPG: On a trip to spring training in 2012, Will Ragland and I waited after the game to get Ben Zobrist‘s autograph on our game ticket stubs. What do you think goes through Ben Zobrist’s head when 30 year old men ask for his autograph on a ticket stub? This entry was posted on March 25, 2014 at 10:00 am and is filed under Offseason with tags AL East, John Lynch, Tampa Bay Rays. You can follow any responses to this entry through the RSS 2.0 feed. You can leave a response, or trackback from your own site.